Arthur (Russell Brand) is your typical man-child. A twenty (or thirty) something, he acts more like an eight year old and everyone treats him accordingly. The only difference between Arthur and the typical Will Ferrell character is that Arthur is filthy rich, the heir to a business conglomerate and the fortune that comes with it. He lives in a New York high rise with his chauffeur/friend, Bitterman (Luis Gonzalez) and his nanny, Hobson (Helen Mirren), and spends his days terrorizing the police in his Batmobile and buying ridiculous things at auction (like the suit Abraham Lincoln died in, which he then wears). His carefree life is put to the test, however, when his mother, Vivienne (Geraldine James) decides she's had it with his embarrassments. She offers Arthur a choice: marry Susan (Jennifer Garner), an ambitious woman who Arthur hates or lose his claim to the family money. Complicating his decision is Naomi (Greta Gerwig), a lower class free spirit that Arthur has become infatuated with. With limited time available, Arthur must grow up quickly and figure out what it is that truly makes him happy. 1. The trailer is horrendous, the type of "advertisement" that sandbags its intended beneficiary before viewers even step into a theater. It's almost as if the studio purposefully picked out the most annoying parts of the movie to include in the trailer. Ouch. 2. I'm not a fan of Brand and I've never understood his charm. To be fair, Get Him to the Greek (and his performance in particular) grows on me every time I happen to catch a part of it on HBO but everything else he's ever done has left me unimpressed. 3. I, like almost everyone else in the world who does not work in Hollywood, am against unnecessary remakes. No one wanted a new Arthur. NO ONE. But for all the negatives coming in, I confess I quite enjoyed my time with Arthur. The entire movie is one absurdity after another, to be sure, but I had fun regardless. Arthur operates within a vacuum in which it creates its own environment and sets its own rules(a New York in which everyone treats Arthur the way a small town would treat a pre-teen in the 1950s) almost like you'd see in a fantasy or sci-fi film. More importantly, the film holds to that environment and those rules and this sort of total escapism serves it well. 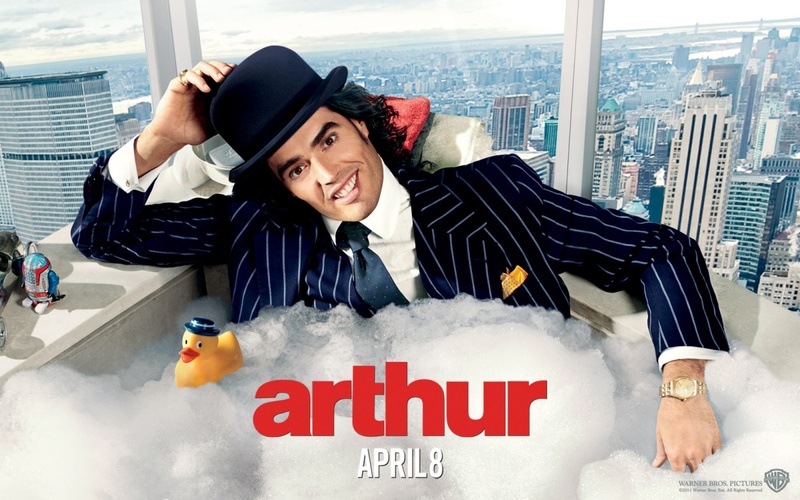 From a comedy standpoint, too, you could do a lot worse than Arthur. It's all very juvenile, of course, but when you're in the right mood and the jokes are plentiful, sometimes easy jokes are the best kind. Arthur is filled to the brim with those and I laughed more than I would have ever dreamed coming in. As far as the performances go, I suppose you couldn't really call what Brand does "acting" since he is basically portraying a cartoon-like version of himself. But what he manages to do with Arthur as opposed to some of his other characters is to make him extremely likeable and sympathetic, much more so than I would have thought possible given that he is a selfish, wealthy, immature man-child. I did not expect to root for Arthur but I did, in large part due to the healthy amount of heart that Brand infuses him with. Arthur is a good person who just doesn't really know how to be a good person and while his redemption isn't the same as what you might get from a drunk (like the original Arthur), it is nonetheless appreciated. Mirren, too, is solid. Now, I have no idea why in the name of The Queen she took this role but since she does bring an element of respectability to Arthur that the film definitely benefits from. She and Brand develop a fun relationship throughout the course of the film and she serves as a quality straight man to Brand's ridiculousness. Their underplayed dynamic is what makes Arthur work and what keeps it from becoming the disaster that I anticipated at the outset.